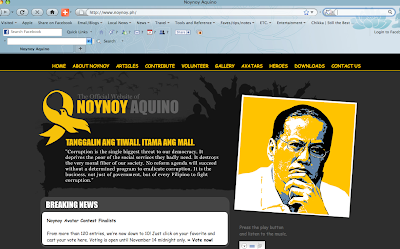 LIBERAL Party presidential candidate Sen. Noynoy Aquino is quite a stranger to the ways of the Internet. Prior to his run for president, I don't think he even had his own web site aside from his page attached on the Senate's own web site. He has only started tweeting, and my guess is it's his new media group tweeting for him and not himself. I have yet to check which of the Noynoy Aquino/Benigno Aquino III Facebook profiles is his real one, although there is an official fan page whose membership just recently cracked the 100,000-mark. With Campaigns and Grey's Yoly Ong now on his side, the Senator's presence on the Net has further expanded with the airing of his 60-second video blogs (VLogs) w/c started today. In a press briefing w/c I attended this morning along w/ other select members of the media, Ong and Melissa Limcaoco, Sen. Aquino's deputy director for new media, said the purpose of these VLogs is to let the public get a taste of the issues the presidentiable is fighting for (or against). A videographer has been going around covering each campaign sortie of Sen. Aquino, capturing his speeches and his interaction w/ the public. In his first VLog, for instance, he is shown speaking w/ a retired public school teacher who complained of not being able to receive her monthly pension from the GSIS because the agency had no money. The VLogs (dubbed "60 secs. w/ Noy") are definitely a step in the right direction for the Aquino campaign after reaping a whirlwind of criticism mainly from the intelligentsia, who detested the MTV featuring Sen. Aquino and his band of artistas. (Of course, they probably don't like Pinoy celebrities to begin with, and the empty-headedness they are thought to represent.) Lighten up people! He needs to attract the masa vote, obvious ba? Although I do agree w/ the critics that we need to see/read/hear more of Sen. Aquino and his platform of govt. instead of just seeing w/c artista endorsed him. So I suppose these VLogs will help the campaign achieve the purpose. The VLogs are unscripted and meant to show the real Noynoy Aquino "in the raw." At the end of each day, the videographer's footages will be tightly edited and strung together to form a theme for each VLog, before being aired. (OK, so technically, the VLogs won't really be quote-unquote, raw.) The footages will be punched up w/ his official campaign jingle, Sya na Nga, w/c I must admit is a really catchy tune, I still hear it playing in my head. LSS much? The VLogs will run daily until Nov. 27, or the day before Sen. Aquino files his official certificate of candidacy at the Comelec. Under the Omnibus Election Code, the campaign period starts on Feb. 9, 2010 for national candidates (or 90 days before May 8 elections), and March 26, 2010 for local candidates (or 45 days before May 8), so the candidates are not supposed to air any TV or radio ads about themselves from the time they file their COCs until the beginning of their respective campaign periods. It isn't clear though if this covers the new Internet platforms, after all, this medium was hardly tapped in previous elections. 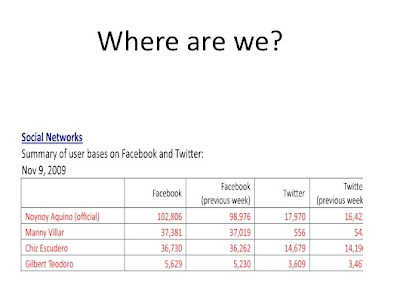 Like last year's U.S. presidential elections, this will be the first time in Philippine electoral history that new media will be used by the presidential candidates (via their web sites, YouTube, Facebook, Twitter, Friendster, cellphones, etc.). Ong says the Aquino campaign is erring on the side of caution and until further ruling by the Comelec, will cease airing the VLogs once Sen. Aquino files his COC. As of press time, however, Ong has yet to answer my question if there are any plans for Sen. Aquino's team mate and VP candidate Sen. MAR Roxas to be included in the Internet campaigns. (After previewing the first three VLogs, it looks like Sen. Aquino's running mate is actually former Bukidnon Rep. Neric Acosta, and not Roxas. Acosta is just all over the place!) For casual political observers like me, Sen. Aquino seems to be conducting his own separate campaign, pretty much disengaged from what should really be a team effort. Are Sen. Aquino's handlers trying to get him elected at all cost, w/o a care who wins the VP slot? Hmmm...again,nagtatanong lang po. (UPDATE 1:05 a.m.) Accdg. to Campaigns PR Inc. Managing Director Richard Arboleda, Sen. MAR Roxas will definitely figure in the Sen. Aquino's future VLogs. Thanks!